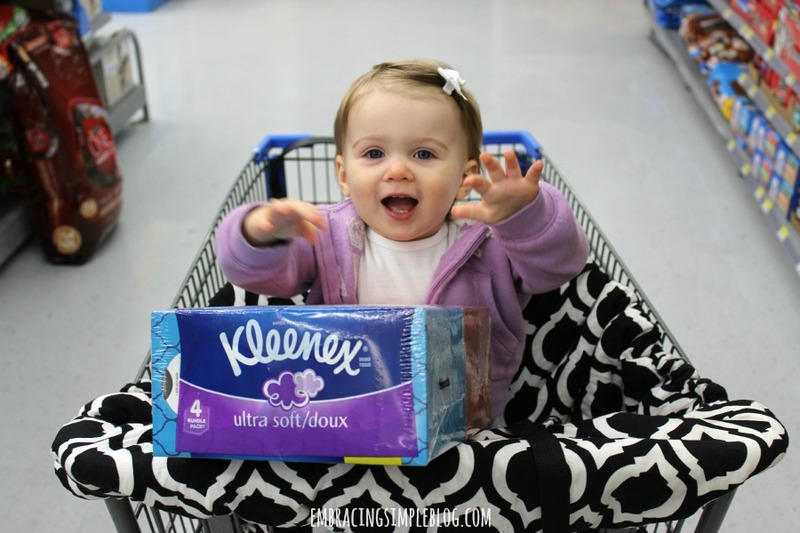 A big thank you to Kleenex Brand for sponsoring this post! As the days become shorter this time of year, I find myself feeling a little down in the dumps over the fun and whimsy of summer being over. While I absolutely love fall and some of winter, the thought of being stuck inside with a toddler for most of the next 5 months can be downright depressing. I decided that instead of dwelling on my negative feelings toward the cold and dreariness of the upcoming months, I am going to focus on joy and spreading kindness to others. I feel like whenever we make an effort to touch the lives of those around us, even in a very small way, it can reap very big benefits for everyone involved. I realize this isn’t exactly a monumental act of kindness that is going to change the world, but it will make it a little brighter. Living in the midwest, people are pretty friendly around these parts. Unless you’re in a big city, a lot of people will say “hello” to you as you walk by and I love it! It seems like such an insignificant act, but it can really turn my day around to get a genuine smile and acknowledgment from a complete stranger. Try it out sometime! This happened to me one morning in the drive thru waiting to get my coffee on my way to work a few years ago and it was such a sweet gesture. I ended up paying for the person’s behind me as well, and at the point I had picked up my coffee at the window, the cashier told me that I was the twelfth person in the chain of paying for the person behind us. I know it’s just coffee and all, but what an awesome feeling it was knowing that people were feeling in a giving mood that morning. It was something that still sticks with me today! My hubby and I used to be much better about this before Little Miss came around, but we sometimes leave sweet little notes around the house for each other. 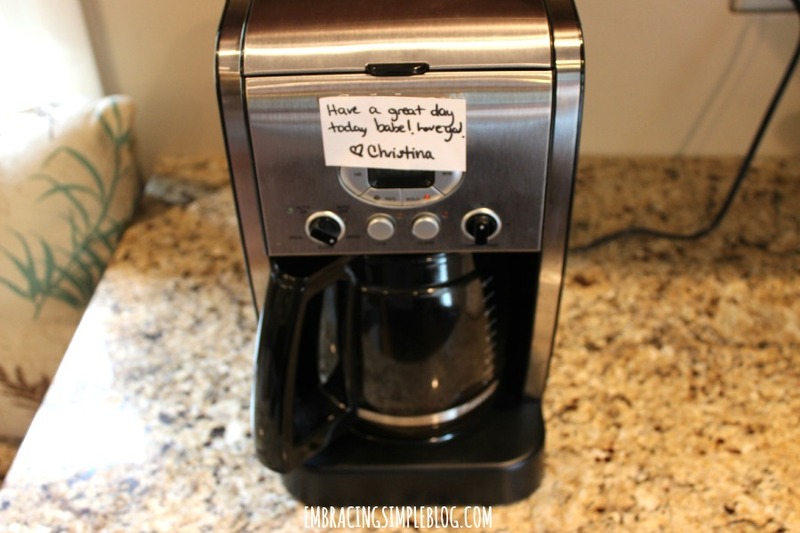 It’s usually just something simple like me leaving a sticky note on the coffee maker or bathroom mirror telling him I love him and to have a safe day of travel if he had to leave on a business trip before I was up for the day. I know he loves when I do that, and I love when he does the same for me. Once Little Miss is in school, I plan on sticking little notes in her lunch box on a regular basis. It’s just something small to show someone you were thinking of them, but can really brighten up their day. How many times have you tried to merge into the lane over to be able to get to your exit, but drivers in that lane wouldn’t let you merge over? It’s always very stressful when that happens, so whenever someone not only lets me in, but I can see they are smiling while they wave me over, I instantly feel at peace and think, “wow that was really nice!”. This is something that truly takes only seconds out of your day (if that), but can really leave someone else feeling good. My good friend Kalie recently did this for me, and it was so touching! I was going through a little bit of a rough time and she had just purchased a book that she knew was exactly what I needed to read at that moment. She graciously offered to lend me her book so I could benefit from it too and it meant a lot to me knowing she cared enough to do that. I was a new parent myself last year, and it was honestly the best thing ever when someone would bring us a meal to enjoy in those early weeks with having a newborn. Being a new parent can be a really tough adjustment, and having a warm and healthy meal to enjoy without having to actually do the work of making it is amazing! Maybe this is just the entrepreneur in me, but whenever I see kids out there at the end of their street selling lemonade or arts & crafts, or any kind of small business venture, I must stop. Not only do kids get so excited about having their efforts of marketing their product pay off (seriously, how can you resist kids jumping up and down while holding a “Lemonade – $.05” sign as you drive by? ), but it shows them that hard work and perseverance pay off. That 5-year-old selling 5 cent drinks at the end of his driveway today could be the next big time entrepreneur tomorrow! 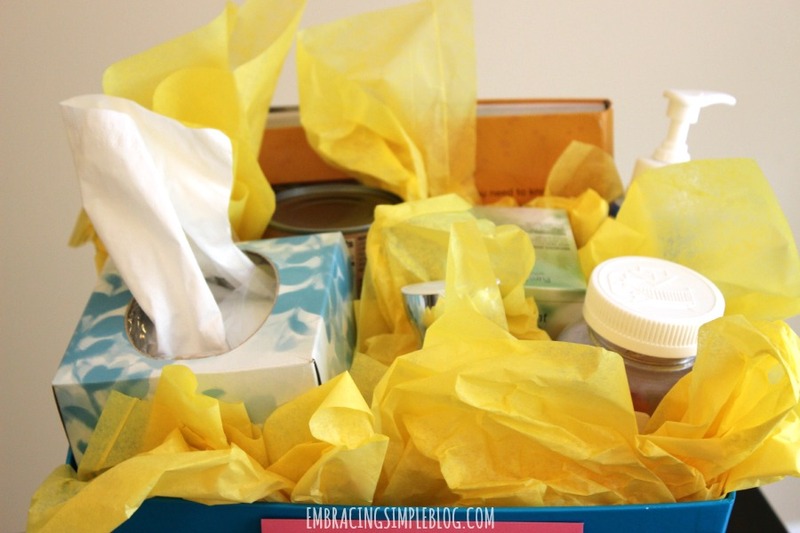 We are officially in cold and flu season, and I was thinking it would be so nice to put together a little care package to give to our next friend or family member that catches a bug of sorts. A little something to maybe just drop off on their porch to show them we care and are thinking of them, and include some items that would brighten their day and help them feel better soon! If you end up heading on over to the Walmart pharmacy section to pick up your own Kleenex facial tissue, you can actually take advantage of an exclusive Walmart offer while stocking up: receive a $5 VUDU credit when you purchase either a 4-pack of 75-ct Kleenex Ultra Soft Tissues or Kleenex Tissues with Lotion (some will have stickers that denote coupon and some will not, but all of the Lotion/Ultra Soft 4-packs are eligible). While I’m not wishing sickness upon anyone, I am looking forward to giving this basket of goodies to someone who is feeling under the weather in the next few weeks. I think it will be the perfect little pick-me-up to make them feel a bit better! 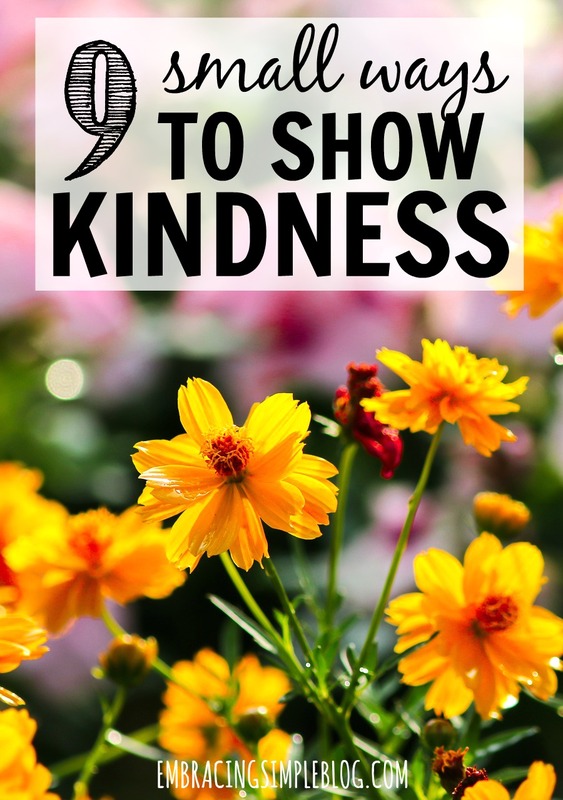 What are some small ways that you like to show kindness to others? Share with me below! This is a sponsored post written by me on behalf of Kleenex Brand, all opinions are 100% my own. I love paying for coffee for the person in the drive thru behind me! I don’t go to Starbucks too often anymore, but I try to do that whenever I’m in the drive thru! Also, love the tip on happily letting someone merge in front of you. I will say, that’s been one of the best things about living in NC. Everyone is such a polite driver!! If you’re trying to turn right out of a plaza or something, people ALWAYS let you go. People will even stop traffic to let you make a left-hand turn. It’s awesome and I definitely repay the polite driving as often as possible. I love the simplicity if thus post. Honestly, it’s Monday morning and my first thought was “blah blah blah”. Then I read it because I really enjoy all your post I’ve read since I subscribed. I was actually inspired and my heart warmed a bit. I especially like the one about allowing someone to merge into traffic and I LOVE the basket ideas. The other one was always stop at lemonade stands. Unless I happen upon one when I’m walking my neighborhood, I’m ashamed to say I never have. I drive by. I will the next time I see one. Aw that is so fantastic Terri, I’m glad that it wasn’t as “blah blah blah” as you thought it would be, haha!! I would probably think that too if I saw the post title, it’s all good! Thank you so much for tweeting, I appreciate it! The care package is such a great idea! Very thoughtful. 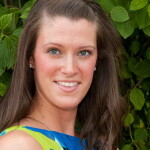 I also love #1 – a simple hello and smile always brightens my day. Love the care package idea 🙂 Also “Let another driver merge into your lane – with a smile on your face” made me wonder if this tip is universal, or if people in our area are just more rude when they drive than others – so we need the reminder haha. Thanks Alex! Haha it’s probably just in our area! When we were on our trip in the south last month, drivers seemed a lot more friendly and definitely not in as much of a rush. 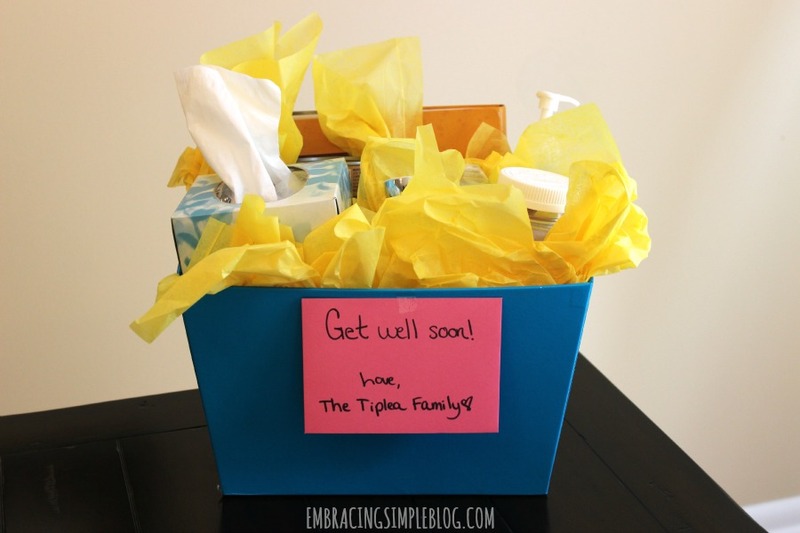 I love care package idea and leaving a sweet note for someone. Not only does #1 make others feel good…it makes you feel goo too! Nothing beats a smile from someone to put a smile on your face. Absolutely Lisa! I think all of these can make you feel good too. Even leaving notes for my hubby makes me feel good knowing he’ll smile when he sees it 🙂 I’m so glad you enjoyed!! What I really like about your sponsored posts Christina is that you don’t make them feel ‘sponsored’. You don’t let them steal your entire post, you still put forward great content first. I really appreciate that! There are some blogs I used to frequent a lot, but not any more, as the sponsored posts took over the entire space and the posts were nothing but seventeen paragraphs of advertisements of a given product. Wow thank you Mariana!! You have no idea how much you saying that means to me!! Sponsored posts take me a significantly longer time than any other post because I always want to make sure that my #1 priority is making the content extremely useful for my readers. That sometimes takes a lot of brainstorming and creativity on my end, but is a challenge I enjoy. It seriously makes my day to hear you confirm that I’m doing a good job at weaving in sponsored posts in a relevant and useful way. Thanks again for the encouragement, you rock!! Christina! I love this list so much. Receiving kindness like this brightens my day and each time it happens, I’m reminded to do the same to others! Aw thanks so much Daisy!! I completely agree! I love paying for the person behind me in the drive thru! It always brightens my day and it’s something I’ve started doing when I’m having a bad day. I’ve also started carrying cash in my car just in case I come across a lemonade stand, since I never really have cash! Thanks Reelika! I love that you and your hubby do that too, I find it to be such a small yet extremely meaningful gesture. I try to smile more in public, and it does make a difference, silly as that sounds. And I’ve been trying to show more appreciation for good service. Being in customer service, I know how important that can be. It can really make your day. Which means that maybe the worker will be extra nice to the customers after me. Aw that is so awesome Kay, you rock for showing kindness to a stranger 🙂 And I’m a complete germaphobe, leaving it on the porch would definitely be my solution for that, lol! Plus I know that when you aren’t feeling well, sometimes you just really don’t feel like getting ready or having anyone see you! I have become my mother in law’s secret santa. She thinks it’s the staff at her building…she looks at the staff with new eyes, she smiles more and it adds a little excitement to her life. I love it! That is so sweet Edie, I love that you’re doing that for your MIL!! Thanks a bunch, Christina. One way I like to be kind to others, particularly strangers, is to pay for the person’s transport fare. The part of the world where I am from we have no drive-thrus and coffee drinkers mostly take it at home.